WILLIAM HILL Live Blackjack RulesThe object of the game is to achieve a higher card count than the dealer without exceeding 21. Aces may be considered 1 or 11. Picture cards have a value of 10 and all other cards are counted as their face value. Busts (the hand count exceeds 21). The winner is determined by which hand's total is closest to 21. A Blackjack beats all other hands totalling 21 (this applies to the dealer as well). If both the dealer and player draw, it is considered a push (tie) and neither hand wins. The player is initially dealt two cards. Bet - To place a bet, the Player must click on the chip value they wish to wager. Hit - Player requests another card to be dealt. The Player may take a hit at any time before standing. Stand - Player chooses to keep dealt hand. The game will automatically stand when the Player has 21 or after doubling down. If a Player splits two aces, only one additional card is dealt for each hand. A hand totalling 21 after splitting aces is considered 21, not Blackjack. Double - When a Player has been dealt the first two cards and believes that the third card will give them a position to beat the Dealer's hand, they can "double down." The wager is doubled, and one additional card is dealt to the Player. The hand is automatically stood, and the Dealer then completes their hand comparing it to the Players' total. Insurance - Gives you a chance to protect yourself when you believe the Dealer may have Blackjack. If the Dealer's first card is an ace, and the Player believes the Dealer's hole card (face down) value is 10, the Player may purchase insurance against Dealer Blackjack at the price of half their initial bet. If the Dealer does have Blackjack, the insurance pays 2 to 1, which corresponds to the amount of the initial bet. If the Player has bought insurance and the Dealer does not have Blackjack, the Player loses his insurance. The Player's initial bet is then settled by comparing his cards with the Dealer's. If the Dealer and the Player both have Blackjack, the game results in a push with the Player profiting by the amount won by taking insurance. 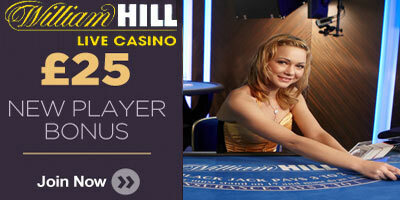 Sign up for an account at William Hill Live Dealer Casino and get a free £25 to play live blackjack. "William Hill Live blackjack: How to play and get a £25 bonus (Video Tutorial)"